History: Founded in 1985 by Tad Bobak and Brook Jones as an adult team, to allow women to continue playing after college. In 1990 Larry Draluck organized girls youth teams. 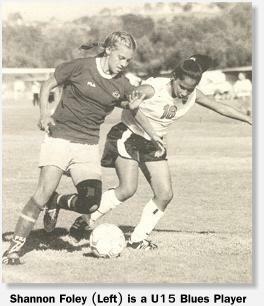 Championships: 2000 U16 girls national championship (Patricia Masotto Cup); 5 USYSA Region IV titles; 12 California Youth Soccer Association-South crowns. Number of teams: 11 (10 youth, ages U10 through U18, one adult). 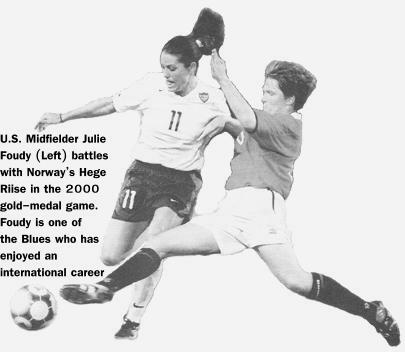 Most famous players: U.S. midfielder Julie Foudy, former U.S. midfielder Jennifer Lalor, Mexico World Cup '99 midfielder Laurie Hill and U.S. goalkeeper Jenni Branam. Number of coaches: 7 (four full-time, three part-time). Coaching salaries: Range between $200-900 a month per team per season. Why no parent coaches: "Parents tend to create problems with other parents." Cost to play: $900 per year. Facilities: Two rented fields at Rancho Capistrano religious retreat. Club philosophy: "First, to create an environment where young girls and ladies can develop themselves as good, positive human beings and citizens. Second, to instill in them the importance of academic preparation. Third, to create an arena for them to use their talents to achieve their highest potential. Recruiting philosophy: "We do not bring other players throughout the year. Once a player makes it through tryouts, she will not be dropped the entire year, except for disciplinary reasons. Also for the first three-quarters of the season, everyone gets a considerable amount of playing time; the last quarter is based on a player's productivity throughout the year. Those things attract players to us." Club's biggest challenges: Keeping club goals in a healthy, positive perspective; generating funds in order to build own. Ongoing controversy: Parents get impatient with the club's long-term developmental goals. "They worry about the playing time their daughters get, and whether the team is winning. We always have to let them know this is a long, six-year process." Why club is female-only: "We want to make this a quality product; we don't want to dilute it or lose the focus of our work." Key to U16 national championship: "Having the whole Southern California Blues club so well structured and administered by Larry Draluck allowed us to create an environment where the girls could prepare themselves and compete well." Youth teams' relationship with Blues adult team: Older players serve as role models and attend younger players' training sessions; 45 Blues have played with adult teams while still youth players (including Foudy and Branam). Biggest rivals: "All the top clubs in Southern California. Fundraising: Gotcha (beachwear company) donates a percentage of receipts from summer warehouse sale; casino night and auction; annual Blues tournament. Unusual facts: All players must memorize the "seven powerful parts of soccer" that are part of the unique teaching system utilized by the club, to "create a picture in their mind that they can turn into action." Contact: Tel. : (714) 549-5936; Email: [email protected]; Web site: www.scblues.com.